Dorsal spinocerebellar tract is labeled in blue at right. The dorsal spinocerebellar tract (posterior spinocerebellar tract, Flechsig's fasciculus, Flechsig's tract) conveys proprioceptive information from proprioceptors in the skeletal muscles and joints to the cerebellum. It is part of the somatosensory system and runs in parallel with the ventral spinocerebellar tract. It carries proprioceptive information from muscle spindles and Golgi tendon organs of ipsilateral part of trunk and lower limb. Proprioceptive information is taken to the spinal cord via central processes of dorsal root ganglia (first order neurons). These central processes travel through the dorsal horn where they synapse with second order neurons of Clarke's nucleus. Axon fibers from Clarke's Nucleus convey this proprioceptive information in the spinal cord in the peripheral region of the funiculus posterior ipsilaterally. The fibers continue to course through the medulla oblongata and the pons of the brainstem, at which point they pass through the inferior cerebellar peduncle and into the cerebellum, where unconscious proprioceptive information is processed. This tract involves two neurons and ends up on the same side of the body. 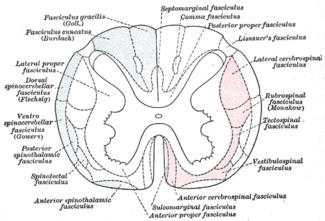 The terms Flechsig's fasciculus and Flechsig's tract are named after German neuroanatomist, psychiatrist and neuropathologist Paul Flechsig.